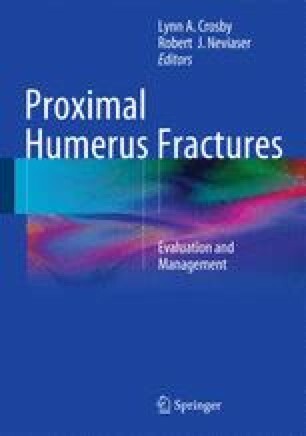 Displaced, unstable two-, three-, and four-part proximal humerus fractures with a vascularized and attached head fragment require reduction and internal fixation. However, optimal surgical treatment remains controversial. Based on our experience, intramedullary (IM) nailing with interlocking screws does provide a suitable alternative to percutaneous pinning and locking plating with the benefits of both (minimal soft-tissue dissection, adequate fixation strength). Analysis of the common complications and technological problems related to previous conventional IM nails have allowed us to define the rationale and characteristics of the ideal IM locking nail. The novel design of the Aequalis IM locking nail combines unique features that allow a less invasive surgical intervention, sustain the vascularization of the fracture fragments, angular stability of proximal fixation, and optimal screw orientation for fixation of the tuberosities. The percutaneous approach for a two-part fracture and the superior transdeltoid approach to fix a three- or four-part fracture are described, and the encouraging results of this novel IM locking nail are reported.